Nokia Ovi Maps is been installed on most handsets or mobile phones developed by Nokia which are equipped with GPS chipset to provide GPS navigation service. Previously, turn by turn navigation in Ovi Maps is chargeable paid service. Since January 21st, 2010, all functions of Ovi Maps application has been made free, including turn-by-turn navigation for drive or walk navigation, and navigation support on more than 70 countries or regions. Currently, the free Ovi Maps is available and supported on Nokia X6, Nokia N97 mini, Nokia E72, Nokia E55, Nokia E52, Nokia 6730 classic, Nokia 6710 Navigator, Nokia 5800 Xpressmusic, Nokia 5800 Navigation Edition, Nokia 5230, where the device user can simply download and install newest version of Ovi Maps. One notable exception is Nokia N97, which is one of the most advanced smartphone available from Nokia. Instead, Nokia N97 will only receive the new version of Ovi Maps from January 28th, 2010, with the release of new firmware update for Nokia N97. The new firmware upgrade integrates latest version of Ovi Maps, with free turn buy turn navigation. 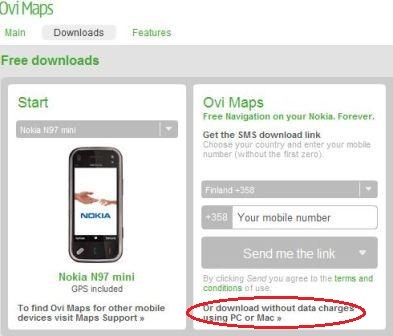 The Ovi Maps for Nokia N97 is released together with new firmware because latest version of Ovi Maps requires at least 20MB of free storage space on internal memory, which the device lacks. The new version of Ovi Maps also features improved and refined user interface (UI), support geo-location sharing on Facebook, and offline navigation or map browsing where maps can be loaded on to the phone device to navigate with GPS without data connection. Select Nokia N97 mini from the list of device, then click on Or download without data change using PC or Mac. Click on Download button. Some web browser may arrive at list of Ovi Maps installer page. In this case, click on the Download button under Nokia N97 mini section (which also applies to Nokia X6 and Nokia 5230). Copy the Ovi Maps .sis or .sisx file to Nokia N97. Use the phone’s File Manager to start installing Ovi Maps. Follow on-screen instruction to complete installation of Ovi Maps.